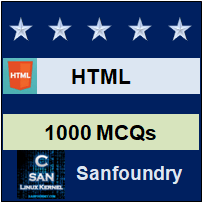 This set of HTML Multiple Choice Questions & Answers (MCQs) focuses on “HTML5 Document Structure Changes”. 1. Which element is used to define a discrete unit of content such as a blogpost, comment, and so on? Explanation: Sections in document is made by the section tag. The class attribute specifies one or more class names to HTML. An article element is semantic element and it contains a standalone piece of content that would make sense if syndicated as an RSS item, for example a news item. 2. HTML5 documents may contains a ___________ element, which is used to set the header section of a document. Explanation: Section element is used to make sections in document. The copyright/footer information is provided by footer element in HTML5. A header for document section is given by header element. The header tag is used to contain the header content of a site. 3. Which element may be used within content to represent material that is tangential? Explanation: <cite> tag defines the title of work. The class attribute specifies one or more class names to HTML. An article tag is similar to <section> or <header> which contains information. The aside tag defines a block of content that is related to the main content around it, but not central to the flow of it. 4. ____________ contains the navigation menu, or other navigation functionality for the page. Explanation: The nav element is for marking up the navigation links or other constructs (eg a search form) that will take you to different pages of the current site, or different areas of the current page. Header contains section of headings. Section element is used to make sections in document. The aside tag defines a block of content that is related to the main content around it, but not central to the flow of it. 5. Which of the following attribute is used to display date/time content? Explanation: To provide both human and machine-friendly date/time content, the element supports a datetime attribute, which should be set to the previously mentioned date format of YYYY-MM-DDThh:mm:ssTZD. Time tag defines date and time (human readable) while datetime tag display machine readable date/time. 6. The element ___________ simply groups items within an enclosed dd tag, though it may associate them with a caption defined by a dt tag. Explanation: HTML documents are delivered as “documents”.These are then parsed, which turns them into the Document Object Model (DOM) internal representation, within the web browser. A self-contained information like images, diagrams are specified by figure tag in HTML. External applications are embed using embed tag. 7. Which of the following element is used for highlighting content similarly to how a highlighter pen might be used on important text in a book? Explanation: <em> tag convert the font in italic one. The <strong> tag is used to denote the importance of text. <bold> tag is used to make the text bold in font size. The mark tag defines marked text and is used to highlight parts of your text. 8. To insert a video, we use a video tag and set its src attribute to a local or remote URL containing a playable movie. Explanation: To show a video in HTML, video element is used. One of the attribute of video called src is used to provide the location of video i.e. it’s URL address. 9. Which tag is used to encapsulate navigation and then style the elements appropriately as menu items? Explanation: Conventionally, many web developers have use <ul></ul> and <li></li> tags to encapsulate navigation and then styled the elements appropriately as menu items. This seems to introduce quite a bit of ambiguity in markup because it may be difficult to determine the difference between a list that has links in it and a list that is simply navigation.